Posted November 9th, 2009 at 7:27 pm | Log in to reply. I made samsun jjajang bap using Haitai’s roasted black bean paste (sold in a jar), and the dish turned out salty. I was able to tone down the saltiness but not the slight bitterness of the sauce. Also, I didn’t add in starchy water to the sauce since it was already thick. 1. Does using roasted black bean paste make the sauce extra salty and slightly bitter? 2. Maybe the roasted black bean sauce are meant for gahn jjajang instead (no need for water and starch)? Posted November 9th, 2009 at 9:30 pm | Log in to reply. I have never used roasted black bean paste, so I don’t know the answer. If it turned out too salty, use less amount. Posted September 21st, 2010 at 2:17 pm | Log in to reply. I’ve recently tried making jjajangmyun not too long ago and bought roasted black bean paste by mistake. I used it anyway to try out. I realized that the roasted is much more saltier and requires a lot more sugar than what maangchi’s recipe asked for with the original paste. Posted August 1st, 2009 at 2:21 pm | Log in to reply. Apparently, this paste is made of soybeans, despite being black. One would have to boil the beans until they’re tender enough to be mashed into a dry paste (therefore, it’s necessary to drain the water before doing this). The paste is then sweetened with either sugar or honey, and a little bit of oil is added so it gets a little more creamy-looking. I don’t really understand how it turns black, but I think it’s because of some black food coloring substance. But this paste is made in different ways in different regions of Asia (South China, North China, etc.). 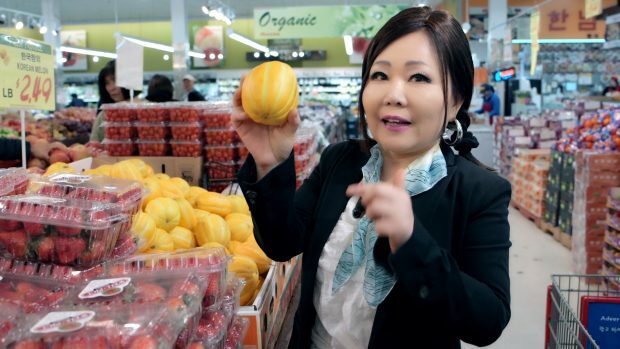 Other ingredients are added (I read about “yellow oil”, flour, and other things) depending on the area. However, if you cannot buy it in a Korean food market (as in my case), I’d try to just do the sweet paste at home, out of soybeans. Or maybe black beans, so they’re black already. Posted February 27th, 2012 at 5:57 pm | Log in to reply. 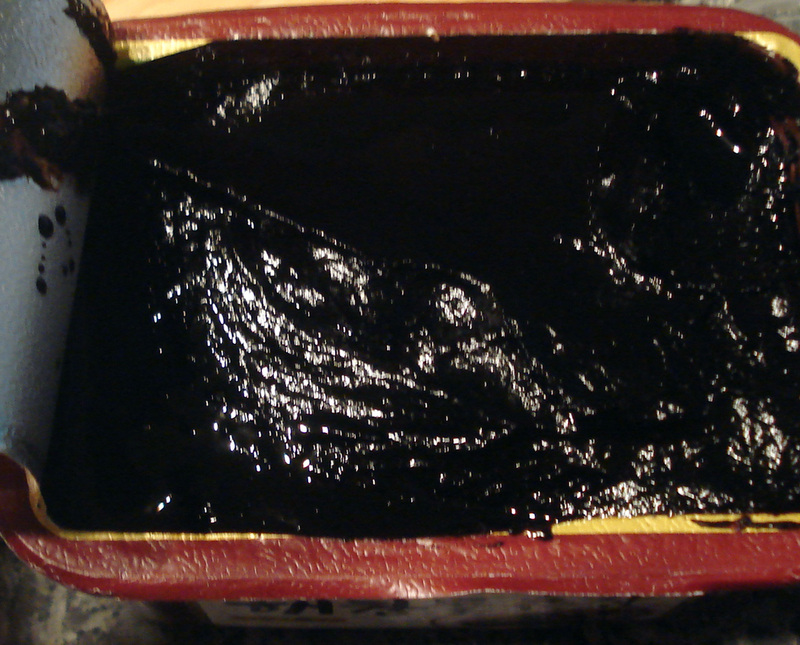 Asian sauces often use black soybeans. You can buy them from edenfoods.com. I use them to make dao-chi (fermented black beans) and soy sauce. You also will need some aspergillus oryzae, or koji, which I get from GEM cultures in Washington state. The first step is to soak the beans in water overnight. Then cook for 15 minutes in a pressure cooker until they are just tender, not to the stage you might consider edible, but no hardness inside the bean. Then strain and dump out onto a clean towel to cool and dry. Then sterilize some flour in a dry skillet until very hot to kill any yeasts and molds in the flour. Put the beans in a big bowl and toss with the flour. Then add the koji spores and put in some wide containers and then into a (Igloo) cooler. After two days, start taking the beans out every day and turn them. When they are coated with a Brie-like coating of white koji mold, put them into a crock. Cover them and weight them down. Then add water until covered by 1 inch of water. Then add 1/4 cup of pickling salt per quart of water and seal the crock. Allow to ferment for 4 months, then remove the beans and dry them. Save the water as it is a simple but very good soy sauce. I don’t know about the korean paste here, but would love to find out how it relates, if at all. Posted May 22nd, 2009 at 10:37 pm | Log in to reply. Hi, is it alright to use sam jjang for jajangmyun recipe? Posted May 22nd, 2009 at 10:41 pm | Log in to reply. no, you will have to find this black bean paste to make jjajangmyun. Ssamjang is totally different from black bean paste. I hope you can find this easily. Posted February 24th, 2009 at 12:37 am | Log in to reply. cool! ssamjang is good dipping sauce, right? Thank you! 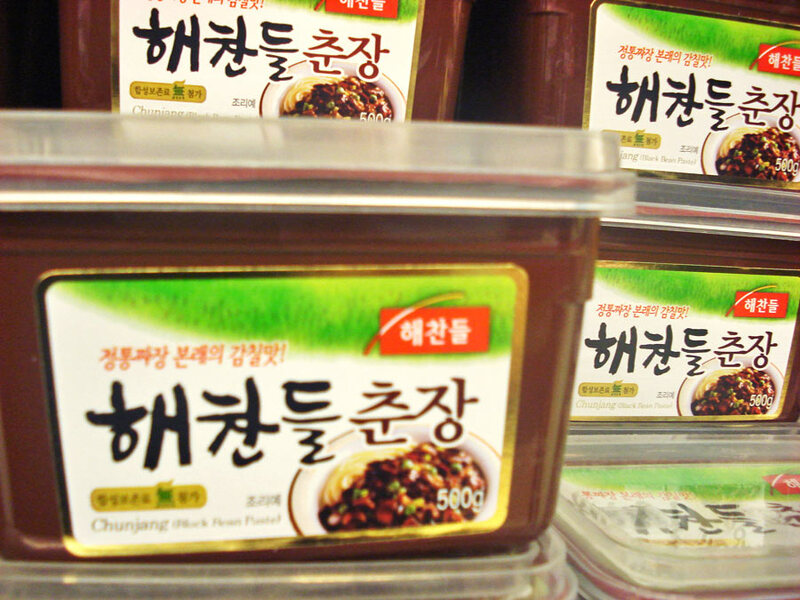 no black bean paste is called “choonjang” in Korean. Soy bean paste is called “doenjang” in Korean. They are totally different. Thank you for your question! Posted February 20th, 2009 at 11:04 pm | Log in to reply. 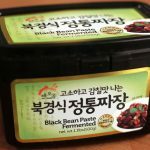 is the black bean paste also called Soybean paste? because i went to a Chinese market called “house of rice” and they have the soybean paste. but im not sure if its the same as the black bean paste. Posted January 3rd, 2009 at 12:46 pm | Log in to reply. I love the Chinese Black Bean dishes. I am looking forward to trying Jja Jang Myun. I have cooked Bulgogi and Galbi for years, but had never had them with ssam jang until I ate at a Korean Restaurant here in Atlanta. I went to a Super H Mart and picked up the Soybean paste and Hot Pepper paste and used your recipe to make ssam jang dipping sauce for my ribs on New Years. Thanks for the delicious addition to our meal. Posted January 3rd, 2009 at 1:22 am | Log in to reply. Thank you for good information about Chinese fermented black beans. Posted January 2nd, 2009 at 9:09 am | Log in to reply. They are dried and fermented Black Beans, typically packed with salt. These are mixed with soy, garlic, etc to make a sauce or marinade. Usually not made into a paste, but will be mashed while making the sauce. Delicious used in making Black Bean SPresipbs(Dim Sum type dish) or ina stir fry with chicken and bell peppers or also stir fired with squid. Posted January 10th, 2010 at 11:45 pm | Log in to reply. HI, the douchi is differently from the one for jajangmyun as it’s quite salty and may come in dry form, where individual beans can be seen. The best for making jajangmyun is the dark brown hoisin sause (different from the red variety) which is also made from douchi,but has slight sweetness. SOme shops sell them thinned with water- try to get the paste which is thicker instead of the sauce.Hope this helps. Posted December 27th, 2008 at 11:20 am | Log in to reply. Posted December 27th, 2008 at 8:54 am | Log in to reply. oh, thank you very much. I am going to post the information on the forum then. Thanks a lot. Posted December 27th, 2008 at 7:54 am | Log in to reply. Posted December 26th, 2008 at 2:40 pm | Log in to reply. Posted December 26th, 2008 at 8:07 am | Log in to reply. Yes, I am hoping to visit India someday! Posted December 26th, 2008 at 7:50 am | Log in to reply. Please check this. I don’t know how to make black bean paste, either. Posted December 26th, 2008 at 7:37 am | Log in to reply.